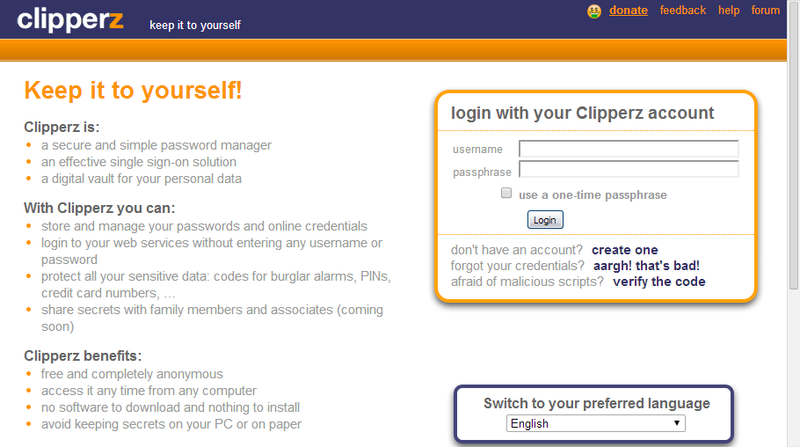 After shamelessly reusing passwords for far too long, I finally decided to get myself a decent password manager. After a few false starts, I ended up going with KeePass. In retrospect, I probably should have started with that, but my thought process didn't work out that way. Originally, my thought was that I wanted to use a web-based password manager. I figured that would work best as I'd be able to access it from any device. But I didn't want to use a third-party service, as I wasn't sure how much I wanted to trust them. So I was looking for something self-hosted. More importantly, I wasn't entirely confident in the overall security of PPMA. For starters, the only data it actually encrypted was the password. Granted, that's the most important piece, that's sort of a minimalist approach to account security. And even worse, I wasn't 100% convinced that that was secure - it's not clear to me that it doesn't store a password or key in session data that could be snooped on a shared server. Of course, I haven't done an extensive analysis, so I don't know if it has any problems, but the possibility was enough to make me wary and I didn't really want to do an extensive audit of the code (there was no documentation to speak of, and certainly nothing on the crypto scheme). The next package I tried was Clipperz. This is actually a service, but their code is open-source, so you could conceivably self-host it. I had a bit more confidence in this one because they actually had some documentation with a decent discussion of how their security worked. The only problem I had with Clipperz was that I couldn't actually get it to work. Their build script had some weird dependencies and was a pain to deal with (it looked like it was trying to check their source control repository for changes before running, for some reason). And once I got it installed, it just flat-out didn't work. I was able to create a new account, but after that every request just returned an error out. And to make things worse, it turns out their PHP backend is ancient and not recommended - it's still using the old-school MySQL database extension. The only other option was the AppEngine Python backend, which wasn't gonna work on my hosting provider. So that was a bust. It was at that point that I started to think using a web-based solution might not be the best idea. Part of this is simply the nature of the web - you're working over a stateless protocol and probably using an RDBMS for persistence. So if you want to encrypt all the user's data and avoid storing their password, then you're already fighting with the medium. A desktop app doesn't have that problem, though - you can encrypt the entire data file and just hold the data in memory when you decrypt it. It also occurred to me that accessing my passwords from any computer might not be as valuable as I'd originally thought. For one thing, I probably can't trust other people's computers. God alone knows what kind of malware or keyloggers might be installed on a random PC I would use to access my passwords. Besides, there's no need to trust a random system when I always have a trusted one with me - namely, my phone. Great! So all I really need is a password manager than runs on Android. Well...no, that won't do it. I don't really want to have to look up passwords on my phone and manually type them into a window on my desktop. So I need something that produces password databases that I can use on both Android and Windows. Luckily, KeePass 2 fits the bill. It has a good feature set, seems to have a good reputation, and the documentation had enough info on how it works to inspire some confidence. The official application is only Windows-based, but there are a number of unofficial ports, including several to iOS and Android. It's even supported by the Ninite installer, so I can easily work it into my standard installation. For me, the key feature that made KeePass viable was that it supports synchronization with a URL. There are extensions that add support for SSH and cloud services, if you're into that sort of thing, but synchronizing via standard FTP or WebDAV is built right in. KeePass also supports triggers that allow you to automatically synchronize your local database with the remote URL on certain events, e.g. opening or saving the database. For the mobile side, I decided to go with Keepass2Android. 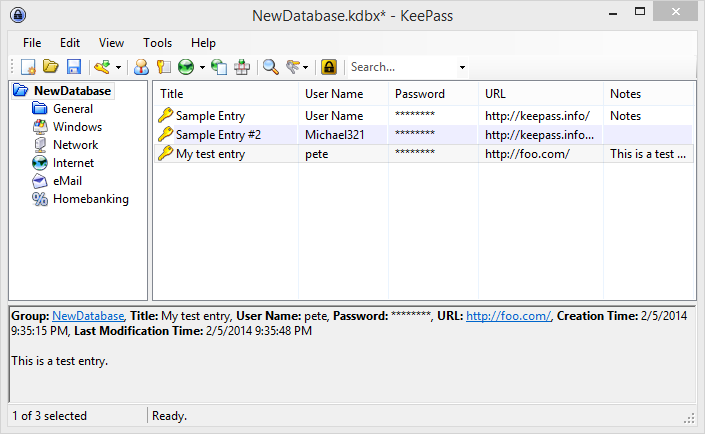 There are several options out there, but I chose this one because it supports reading and writing the KeePass 2.x database format (which not all of them do) and can directly read and write files to FTP and WebDAV. It's also available as an APK download from the developer's site, as opposed to being available exclusively through the Google Play store, which means I can easily install it on my Kindle Fire. Keepass2Android also has a handy little feature called "QuickUnlock", which allows you one chance to unlock your database by typing just the last few characters of your passphrase. If you get it wrong the database is locked and you need to enter the full passphrase. This addresses one of my main complaints about smart phones - the virtual keyboards work to actively discourage good passwords because they're so damned hard to type. I chose a long passphrase which takes several seconds to type on a full keyboard - on a virtual keyboard, it's absolutely excruciating. This way, I don't have to massively compromise security for usability. So, in the end, my setup ended up being fairly straight-forward. I install KeePass on all my computers. I copy my KeePass database to the WebDAV server I have set up on my web hosting. I set up all my computers with a trigger to sync with the remote URL. I install Keepass2Android on my phone and tablet. I configure them to open the database directly from the URL. Keepass2Android caches remote databases, so this is effectively the same as the desktop sync setup. Profit! I now get my password database synchronized among all my computers and devices. I've been using this setup for close to a month now, and it works pretty darn well. Good encryption, good usability, plenty of backups, and I didn't even have to involve a third-party service. Who did you pick for hosting please? The second paragraph in the article was exactly about me! I've been searching for a good self-hosted solution for a long time, however, it seems that there is no suitable solution for me at the moment, except for KeePass. We also use it within our company, but the most annoying thing in it is that it is more a single-user solution rather than a cooperative one. At this moment I've tried all the alternatives according to alternativeto.net, but still no luck - the only appropriate is TeamPass, but it threw errors when saving a new password entry. Enter the sum of 99 and 47.